Productivity Inc. and The Ohio State University’s Fisher College of Business join together to offer the Lean Tool Awareness Certificate Program (LTAC). Learn how to implement Lean and enhance positive change in your company through this unique program, taught by the leaders in Lean education. In this intensive one-week, fully accredited program held on the campus of The Ohio State University, you will learn how and where to start on your Lean journey. Experienced Lean practitioners and educators transfer knowledge of the Lean fundamentals through a combination of classroom lecture, group activities, and simulations. The Ohio State University. Graduates of the LTAC Program earn 4 CEUs. Designed for those seeking a solid understanding of Lean techniques and for managers, supervisors, and team leaders responsible for continuous improvement projects. Learn a systemic approach to Lean implementation. Gain an understanding of key concepts of Lean and how to apply them. Discover the importance of creating standards. Differentiate yourself in a market filled with skilled professionals. 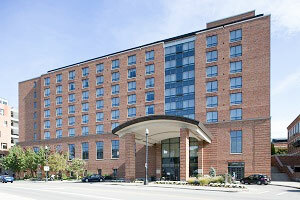 A block of rooms is being held for Productivity Inc. LTAC attendees at The Blackwell Hotel on The Ohio State University campus. Address: 2110 Tuttle Park Place, Columbus, Ohio 43210. Productivity Inc. attendees receive a reduced rate of $145.00 per night, single or double occupancy. Rate includes hot buffet breakfast. Please call 614.247.4000 or toll-free 866.247.4003 for reservations, and identify yourself as a Productivity Inc. LTAC program attendee. The special rate will be available until four weeks prior to the event; after this date the hotel cannot guarantee availability.